This 3CD set in a deluxe fold out packaging was released to celebrate 15 years of AMP and is a collection of singles, non-album vinyl only tracks (16 songs) and a lot of unreleased material (12 songs). The booklet also includes extensive details about each track. Each CD is over 70 minutes in length, so a lot of music for the money. 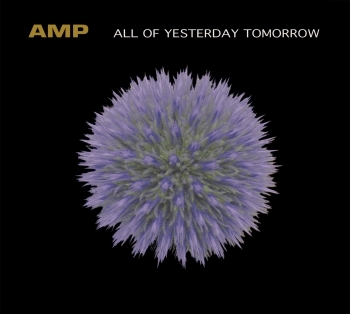 But for those not familiar with AMP, AMP is primarily Richard AMP and Karine Charff, but to say it was these two alone would not be giving credit to the more than 20 collaborators they have had including Marc Challans, Richard Dickaty, Olivier Gauthier, Dave Pearce (Flying Saucer Attack), Matt Elliot (Flying Saucer Attack), all Richard’s mates from The Secret Garden (john and Guy Cooper, Gareth Mitchell) and many others..
As for the music, well, lets say that is is challenging.. The band has the approach to take natural sampled sounds from the world and mix and meld these with sounds they create and with in an improvised (not entirely) form create music that mixes sounds and noises with melody to create special atmospheres.. Most of the music is instrumental but not entirely. The vocals are not meant to lead the way but to be another instrument in the soundscape….. Special music from a special band..